Keep us, O Lord, constant in faith and zealous in witness, after the examples of thy servants Hugh Latimer, Nicholas Ridley, and Thomas Cranmer; that we may live in thy fear, die in thy favor, and rest in thy peace; for the sake of Jesus Christ thy Son our Lord, who liveth and reigneth with thee and the Holy Spirit, one God, now and for ever. Keep us, O Lord, constant in faith and zealous in witness, after the examples of your servants Hugh Latimer, Nicholas Ridley, and Thomas Cranmer; that we may live in your fear, die in your favor, and rest in your peace; for the sake of Jesus Christ your Son our Lord, who lives and reigns with you and the Holy Spirit, one God, now and for ever. When Henry the Eighth of England died, he left three heirs: his son Edward and his two daughters, Mary and Elizabeth. Edward succeeded to the throne and was a staunch Protestant (or at least his advisors were). Under his rule, the church services, previously in Latin, were translated into English, and other changes were made. When Edward died, the throne passed to his sister Mary, who was firmly Roman Catholic in her beliefs. She determined to return England to union with the Pope. With more diplomacy, she might have succeeded. But she was headstrong and would take no advice. Her mother had been Spanish, and she determined to marry the heir to the throne of Spain, not realizing how much her people (of all religious persuasions) feared that this would make England a province of the Spanish Empire. She insisted that the best way to deal with heresy was to burn as many heretics as possible. (It is worth noting that her husband was opposed to this.) In the course of a five-year reign, she lost all the English holdings on the continent of Europe, she lost the affection of her people, and she lost any chance of a peaceful religious settlement in England. 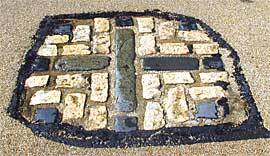 Of the nearly three hundred persons burned by her orders, the most famous are the Oxford Martyrs, commemorated today. 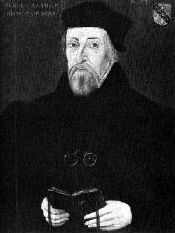 Hugh Latimer was famous as a preacher. He was Bishop of Worcester (pronounced WOOS-ter) in the time of King Henry, but resigned in protest against the King's refusal to allow the Protestant reforms that Latimer desired. Latimer's sermons speak little of doctrine; he preferred to urge men to upright living and devoutness in prayer. But when Mary came to the throne, he was arrested, tried for heresy, and burned together with his friend Nicholas Ridley. His last words at the stake are well known: "Be of good cheer, Master Ridley, and play the man, for we shall this day light such a candle in England as I trust by God's grace shall never be put out." Nicholas Ridley became an adherent of the Protestant cause while a student at Cambridge. He was a friend of Archbishop Cranmer and became private chaplain first to Cranmer and then to King Henry. Under the reign of Edward, he became bishop of Rochester, and was part of the committee that drew up the first English Book of Common Prayer. 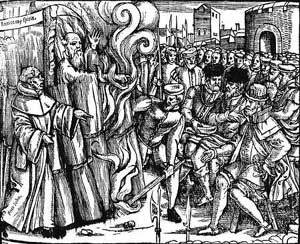 When Mary came to the throne, he was arrested, tried, and burned with Latimer at Oxford on 16 October 1555. 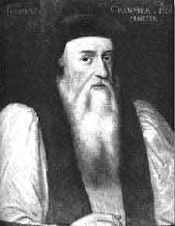 Thomas Cranmer was Archbishop of Canterbury in the days of Henry, and defended the position that Henry's marriage to Katharine of Aragon (Spain) was null and void. When Edward came to the throne, Cranmer was foremost in translating the worship of the Church into English (his friends and enemies agree that he was an extraordinarily gifted translator) and securing the use of the new forms of worship. When Mary came to the throne, Cranmer was in a quandary. He had believed, with a fervor that many people today will find hard to understand, that it is the duty of every Christian to obey the monarch, and that "the powers that be are ordained of God" (Romans 13). As long as the monarch was ordering things that Cranmer thought good, it was easy for Cranmer to believe that the king was sent by God's providence to guide the people in the path of true religion, and that disobedience to the king was disobedience to God. Now Mary was Queen, and commanding him to return to the Roman obedience. Cranmer five times wrote a letter of submission to the Pope and to Roman Catholic doctrines, and four times he tore it up. In the end, he submitted. 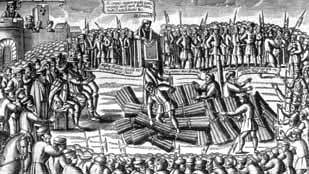 However, Mary was unwilling to believe that the submission was sincere, and he was ordered to be burned at Oxford on 21 March 1556. At the very end, he repudiated his final letter of submission, and announced that he died a Protestant. He said, "I have sinned, in that I signed with my hand what I did not believe with my heart. When the flames are lit, this hand shall be the first to burn." And when the fire was lit around his feet, he leaned forward and held his right hand in the fire until it was charred to a stump. Aside from this, he did not speak or move, except that once he raised his left hand to wipe the sweat from his forehead. An excellent biography of Cranmer has appeared recently. Click here for more information or to purchase it.